If I had a superpower, it would be rationalizing. Did you find a pair of boots that you love but they’re wildly expensive? Text me and I will tell you about the only time in my life I have splurged on boots and how lovely they are. Were you having a nostalgic conversation with a friend about boxed macaroni and cheese and now you’re craving it? I say you’re basically obligated to reunite with it once in a while as an adult for, like, reassessment. But that’s my base level of rationalizing; what I did last weekend was Olympic. Despite the story the archives will tell you, I only make those ladle and flip (and flip and repeat until you’re not even sure you want pancakes anymore) style of flapjacks once in a while. I’m just not that ambitious/functional at the hours in which my kids insist I should be awake. When the urge, guilt, whatever, strikes to be that cool parent who makes pancakes on the weekends and not just to Instagram it, more often than not I make a big dutch baby instead — you know, those loupy, bronzed, crepe-like pancake showoffs. You almost definitely already have the ingredients on hand, you can whisk the ingredients with a fork and all the magic happens hands-off, in the oven — it’s win-win. This past weekend, however, I decide what we really needed in our lives were dark chocolate dutch babies and that (here we go) they were actually probably better for us anyway. I mean, did you know that cocoa powder I swapped out some of the all-purpose flour for has way more protein and fiber than flour? And fewer carbs? No gluten either, oh, and don’t get me started on magnesium, guys. Cocoa powder kills at magnesium. Chocolate is basically a vitamin. I mean, sure, you don’t have to then coat it with shaved dark chocolate (iron! ), fresh berries (Vitamin C!) and a puff of powdered sugar (yeah…), but you should. You’ll probably also want a drizzle of syrup because these are almost unsweetened. And you’ll probably need to repeat this every weekend for a while because it’s basic breakfast math that chocolate pancakes > pancakes without chocolate. You cannot skimp on the butter. I know it seems ludicrous to use 4 tablespoons (2 ounces) of butter to make one very large pancake, I get it. It even looks like too much. But here, let the Queen of Rationalizing explain it: Most pancake recipes have a few tablespoons of melted butter in the batter plus a few more tablespoons required for frying. This only has it in the pan. And it’s essential because whenever I’ve tried to use less, the pancake sticks in a spot and doesn’t get those glorious rumples (see here). The pancake needs to be able slip along the surface of the pan to do its pretty thing. If you have a nonstick frying pan that’s oven-safe at 425 degrees F, you can probably get away with less; otherwise, just go with it. An eggier batter made a more dramatic pancake: I most often made big dutch baby pancakes in the David Eyre’s style, 2 eggs in a 12-inch frying pan. But they’re only billowy about 2/3 of the time (see here). When I referred back to the recipe I grew up with, I realized I always used to use more in a big pan, and sure enough, 4 eggs made a much more dramatic, and reliably dramatic, pancake than 2, and was more filling too. Using a little less milk and a little less flour also increased the pouf. Finally, dutch baby-style pancakes will always partially fall right in the minute after leaving the oven so if you want people to ooh and ah over it, have them stand by the oven when the timer rings. You can use this recipe to make 1 big 12-inch pancake or 2 smaller 9-inch pancakes. I haven’t used it to make 4 6-inch pancakes, but I have a feeling I will in the near future. Whisk eggs, sugar and salt in the bottom of a medium bowl. Add flour and cocoa, whisking until mostly smooth (some tiny lumps are okay, but whisk out what you can). Drizzle in milk, whisking the whole time. Heat a 12-inch ovenproof skillet on the stove over high heat. Add butter and melt, tipping the pan around so it butters the sides too. Turn heat off and scrape batter into pan. Transfer skillet to oven and bake for 16 to 18 minutes, until pancake is billowy. Remove from oven and grate chocolate over, to taste. Dust generously with powdered sugar. Cut in halves or quarters and eat with berries and syrup, if desired. A dutch pancake is the very best breakfast – looks so impressive, but is ridiculously easy. Love the one from your book. Hey! Are you from Eugene? I loooove their plain buttermilk pancakes. Perfection. My husband always gets the dutch baby. We have them in Washington and I always want to try the dutch baby, but that 49er flapjack is just so good I never order anything else! 49ers are my always order at OPH. When I’m, you know, not making these at home…. I always go when in Portland, just for the apple Dutch babies. I found one in the Contra Costa area. Yum! thanks for looking out for all the readers! you know, to make sure that we get all the vitamins and nutrients and chocolate in (; this looks like a delicious variation on a dutch baby, even if i probably wouldn’t want to put lemon juice on it like i normally do with dutch babies. Yum!! We do individual dutch babies (puffy pancakes we call them) in muffin tins as special treats on the weekend. Clearly we are going to have to try chocolate (for Valentine’s Day! I can rationalize too ;) I think you need a little whip cream on the side like we do. I think all of your rationalizations are perfectly rational! I will be trying these this weekend if not before! Grammarians, can I un-capitalize the “Dutch” in Dutch baby because it’s not really Dutch, just what we call it? I mean, we can write “French fries” as “french fries,” right? Thank YOU for the Middle Eastern nachos recipe, which we’ve been eating, like, fortnightly. I’m sure it’s so delicious that you can type the entire thing in CAPS. And underline it. And italicized it. And use bold. In a larger font. You could write it in crayon. You are a goddess and we love you. Would you capitalize or not the “dutch” in “Dutch chocolate”? I get so many compliments that should really go to Deb. Thank you, Deb, for feeding all my family and friends. 1) Can I blend the batter in the blender? We’re all about minimal cleanup around here. 2) Could I cook in a 9×9 pyrex? That goes in the dishwasher…. I also wanted to pay you a quick compliment: I appreciate the evolution of your blog. I love the content/fabulousness of the recipes has remained but you’ve evolved for life with two children (which I also have). Your blog is my go-to cookbook. Thank you! 1. Yes. My original recipe came from my mom’s 1970s blender cookbook. 2. Yes, I have absolutely used cake and other pans when I didn’t have ovenproof skillets and they work just fine. However, the 9×9 puts you at slightly above the surface area of a half-recipe and below that of the full or 3/4-recipe. Probably doesn’t matter, but if you wish to scale accordingly, you can. FWIW, Melissa Clark has a Dutch baby recipe with 8 (!) eggs in the 12-inch pan and it looks very billowy suggesting to me that if you were to make the full recipe in your smaller dish, nothing bad would happen. I have often made a large Dutch baby in a 9×13 pan. It doesn’t look quite as amazing as the round kind, but it’s delicious. The recipe (which I found in, of all things, the Complete Tightwad Gazette) called for 2 eggs, 1/2 cup flour, 1/2 cup milk, and 5 tablespoons butter. Same oven temp and baking time. Do you think I could double this and put it in a 9×13 pan? My four children eat a lot of Dutch baby, or as they call it, baby Dutch! A 9×13 actually has almost exactly the same surface area as a 12-inch round skillet (113 vs. 117 square inches) so it should work just fine. That worked just great. They polished off three pans! Thanks! When I double the recipe (without the cocoa) I bake it in two 9-inch glass pie pans. For whatever reason, it seems more airy and crispy when cooked in two pie plates rather than a 9 x 13-inch pan. This looks amazing! Just curious-I have a 10-inch cast iron skillet, but not a 12-inch one. Can I get away with using the slightly smaller skillet? Yes. I’m torn between telling you to 3/4 the recipe or, given what I mention here about a Melissa Clark recipe, tell you to just make it in full because it might be fine. I’ve made the previous dutch baby recipe in a 10in skillet and it turns just fine! Go forth and dutch! Another source I trust, J. Kenji López-Alt, makes a 7-egg Dutch baby in a 10-inch skillet. So you should be fine! I did, in fact, make this for lunch. It was simple and fast and really tasty. I’d never made one before. I like Jacob’s idea to turn ii into dessert. I think you have an apple dutch baby in the archives. I’ll do that one this weekend. That should work nicely with French vanilla ice cream and caramel sauce. Yes? 5 eggs a cup of flour and a cup of milk. Butter in the pan whisk until oven ready and in it goes. Easy! But this is a game changer. All my girls will thank you as dutch babies are a weekly menu item for us. Thank you for clarifying why my NYT Dutch babies aren’t always consistent! Sometimes I use 2, according to the NYT, and other times 3, by way of The Kitchn. I will definitely try the one you grew up with. This chocolate Dutch baby looks amazing. I used to make Dutch babies for my 3 year old several times a week (because he needs a high fat diet because of his health condition), and the last year he hasn’t been into any of the breakfast foods I normally feed him. I think these will do the trick :). Thank you for sharing the recipe you grew up with and the chocolate version. These gorgeous boots were over $300. the most money I have EVER spent on an item of clothing and they are worth every penny. I think I’m love. Bookmarking for when I get slim enough for boots. Do you like boots? Do you have feet? Voilà, you are slim enough for boots! No reason to put off things that will make you happy because of your body size. Trisha- THAT is the single, most fantastically simple way to boost anyone’s moral and self esteem! And, I’ll add, as a person who has trouble finding boots, due to thick calves, the internet is awash with boots for people of all sizes. I may or may not have ordered myself 3 pairs right before Christmas. Just google wide calf boot and you will have a myriad of options. My sister saw both the dutch baby recipe and the boot comments and sent me a link. What a great post! I just made a dutch baby pancake recently, but not chocolate…this will happen soon. Also just got these boots and got compliments the first time I wore them. Your rationalization of this as healthy sounds spot-on! One could even argue that the addition of syrup is adding a vegetable of some kind. This looks delicious, and I didn’t realize these were so easy to make. I see a chocolate Dutch baby in my future. I have never had a Dutch baby. I am excited to try this for my family. You’re my hero!! Yes! Yes! Yes! Chocolate is basically a vitamin and I take mine every day. I’ll make this, this weekend. Thanks a bunch. Hootenannie pancakes. Why do we call them that? Is it regional? Often had these for dinner, always with powered sugar. Never tried chocolate though, maybe for Valentines, I wonder how they would be with strawberries? Serious Eats recommends making batter the night before to get more puff. So you should be fine. Looks amazing! My husband loves chocolate so we try to sneak it into everything that’s remotely reasonable. One question: is it possible to replace the milk with soy or almond or coconut milk? So, this basically sounds like Yorkshire pudding with sugar and cocoa, yes? (Was that a rationalization?) Since I love Yorkshire pudding, I’ll definitely have to try this. Ah, this looks great! I have been making savory Dutch Babies (although we call them Giant Pancakes in my family) for years. Some herbs in the batter, salt and pepper, stir in crumbled bacon or diced ham, green onions, sprinkle cheese on it as it goes in the oven, or as it comes out. Makes a great cheap dinner. Now I need to try the chocolate version. Thanks! Any thoughts on gluten-free flour? Since the amount of flour is so small anyway, I think it might work? I have a celiac nephew who’d lose his mind over this. I’ve been making lovely pancakes with chickpea flour. I bet that would work. Is this sweet enough to be dessert? Maybe with barely-sweetened whipped cream on top? Or would you want more sugar in the batter itself? Well, my son had a wedge with chocolate ice cream, whipped cream, a cherry and a tiny spot of hot fudge (not your usual SK evening, just some very lucky leftovers) so I’d say yes. However, it really is barely sweetened. I haven’t made it with more sugar, not sure if there would be any structural concern, but it might be an easier way to go. Or just sweeter toppings. Maybe with a little Irish Cream in the whipped cream? Or maybe just in the coffee… or some cherry or raspberry sauce, just to by luxurious. But I like my desserts on the less sweet side. Just to made this for “lunch” and it was delicious! Lazy hack: put the pan in the oven while it preheats and then swirl the butter in the hot pan. I’ve found for regular dutch babies that resting the batter helps it get billowy-er. Next time I make this, I’ll try resting it 20 min and let you know how it goes. That’s interesting about the resting time! The recipe I’ve always used says to “immediately pour batter into hot buttered pan,” but I think going to have to try making the batter ahead of time. More billowy sounds good to me! Thanks. I showed this to my daughter and her response was “I need this in my face. Now.” Guess we’re making it for breakfast tomorrow! If I made this, it would be a single serving. With the recipe as is. I’m sure this is a dumb question- but natural or dutch-processed here? Either works; it’s not part of the chemical reaction. Thanks- I’ve screwed that up before. I tried to donate blood two weeks ago and my iron was too low so basically if I make this pancake with dark chocolate shavings every day until my next eligibility date I will LITERALLY BE SAVING PEOPLE’S LIVES, is my understanding of the situation. You get a gold star in my book! Cast iron is cheap and ovenproof — it will last forever, and it’s very forgiving — even if you don’t season it correctly, or let it get rusty, you can always start again. Go to Goodwill, I get all of my cookware there. A baking dish should work fine. A 9×13 is about the same surface area, or you can make it smaller and it will billow up even more. So, soo need this tonight. This looks divine! I will definitelly try it next weekend morning! I made this for dinner tonight, swapping out shaved chocolate for chopped Andes mint. Delicious and timely on this cloudy, yucky cold winter day. Aw, Andes mint make me think of my grandmother (who stuck them in her cream de menthe brownies)… great idea. Ever since the Bob’s Burger episode with the dutch baby I’ve been obsessed with them! I couldn’t believe I’d never made one before then but they’ve been pretty regular on the rotation ever since! Can’t wait to try it in chocolate! Anyone have suggestions for how many muffin tins I should split this over if I am going the muffin tin route? So I have tried it twice in muffin cups, and this is what I have learned. This amount of batter works perfectly for 12 regular muffin sized pancakes, with just under 1/4 cup of batter per cup. The butter can be melted in the pan in the oven, and swirled around the cups (though it helps that my muffin tin is non-stick). But 60g of butter is more than you need, and you will be left with little pools of butter inside the pancakes. Even 45g was too much. Next time I will try with 30g! i had pools of butter inside a recipe i found from america’s test kitchen. i didn’t object! We made your gingerbread dutch baby this morning for breakfast … and then this pops up! Looks great! We make caramelized apples or pears to go with the gingerbread one. I bet pears would be lovely with this chocolate dutch baby! Looks delicious! Why not put some of the butter in the batter? Would that negatively affect the texture or the lovely rumpling? It’s just not necessary. I used to put half and leave half in the pan but it was more prone to sticking and didn’t change the pancake in any way. Deb do you’d think that this would work if a gluten feee baking flour blend were substituted? Wondering if anyone has used coconut oil instead of butter in this recipe? Peanutbutter on the chocolate dutch baby! Now, please. I’m sure it would work just fine here. Is this basically a giant popover? Because I think next time my son wants pancakes I will try to distract him with this. I am imagining it in strawberry season with lots of sliced berries soaked in a little balsamic vinegar . . . This was the first thing I saw this morning, just barely awake. I decided it was the ONLY way to chase away the cold (Northern German) winter morning. I followed the directions for once, and it looked exactly like your photo and tasted divine!! We will be having this again and again! Thank-you! Chocolate is basically a vitamin. Okay. So either you’re reading my mind, or I’m reading yours. Made a Dutch baby last night and thought how nice a chocolate one would be. Thanks for the recipe. I’ve never made a dutch baby, but after seeing this one, I absolutely want one. NOW! And chocolate for breakfast — I mean that is sheer genius! So if you are making it in a 9inch Pyrex do you melt the butter in the oven first before adding the batter or can I just melt in a small pan and add to the Pyrex. I like the oven idea one less pot to wash. When we were kids, my parents would put the butter to melt in the oven, in the pan. They’d then open, side out the rack, tip the pan around a bit, and pour batter in. I can’t remember the temperature…we’ve never turned it off. I like that idea–save a little money. I REALLY like the idea of letting batter rest overnight. Does anyone know if you can leave it at room temp overnight? My house stays pretty cold, though not 33*F cold. This is going to be breakfast on my birthday! Known as pannukakku in our neck of the woods in Michigan. First, I will definitely make this! Yummy. Second, I bought a pair of Ferragamo boots years before I could really afford them. And, while I had to rationalize the purchase at the time I still have and love them 26 years later. So enjoy your boots :-) I don’t have your number to text. And, in my opinion, chocolate never needs to be rationalized, explained or anything but enjoyed. Thank you for sharing all of your experiences, recipes and everything. Happy New Year. Oh wonderful! I wish I could try this now ! It looks like heaven! Beautiful bake indeed. Please could we have some UK/European measurements for this recipe? Plus, I’ve never had a recipe of yours fail so I’m sure it will be excellent! Yes, weights now added. And thank you. I have been called an enabler, a time or two, because I do take that similar role that you write about. But I like your word (rationalizing) better. And I think I must now make my first Dutch Baby, especially considering it’s a chocolate one and all! I have a website suggestion. Can you tell me where to post this since what I have to say probably won’t be printed as a comment. Thanks. I’m not sure I fully follow… are you trying to make a comment, which you did? I was thinking of Hemlock Stew for inauguration weekend, but must admit this looks better. Great quick, hands-free breakfast! I made the batter ahead of time and refrigerated (3 hours)–as per others’ comments that it should hold well–and baked it in a 9 inch glass pie plate in my toaster oven for 18 minutes. Served it with a quick strawberry syrup that I cooked up while it was baking. I’ve never made or had a dutch baby before, so I’m not entirely sure what the texture is supposed to be like, but I think it turned out well. The center was dense, and the outer crust airy-er. Of course, since I made it in my toaster oven, there was a bit of blackening on one portion of the crust after it rose, but not so much to prevent me from doing it again in future. Also as per another commenter, I melted the butter by preheating the pie plate, and then swirled to coat. I think I could have gotten away with a tablespoon less because of the size of the plate. As it was, the butter ended up pooling around the sides and on top once I added the batter, and it remained after baking. It made for a less appetizing appearance. Would love to know if this can be made with a nut flour, such as hazelnut. Hazelnut and chocolate just go so well together. I am making this for my birthday February 14th. I may have to test the recipe this weekend though. This sounds fabulous! Pls. explain how to make it without an overproof skillet. Thanks so much!! Use a cake pan or casserole dish. I made half a recipe, used cashew milk an earth balance, and baked it in a small cast iron skillet. Worked like a charm. Sorry–the small cast iron pan is an 8-incher. I made this recipe this morning, using the full 4T of butter and a cast iron skillet. It was good but just too much butter, despite the warning. I’d try 2.5-3T if I make it again. Maple syrup was ok on top but I also tried plain Greek yogurt and homemade raspberry jam which was delicious! Ack! What did I do? It didn’t rise at all and I ended up over cooking it. It was like an overdone brownie. This looks like a great base for banana “wheels”, vanilla ice cream and perhaps a bit of hot fudge and/or caramel and whipped cream. Perhaps a bit much for breakfast, but at least bananas! We have plain puffy pancakes and apple but we’ve never tried chocolate! I ran it by my 10 year-old daughter and she said yes, if you add chocolate chips. I said you’ve got you’re a a deal. Keep you posted. We always make our pannekoeken (same same) in glass pie plates. For whatever kitchen-physics reason, this dish seems to be extremely flexible in terms of size or shape of cooking container. Sometimes they’re thicker, sometimes they’re poofier, sometimes they’re more crepe-y, sometimes more custard-y – but ALWAYS delicious. A standard “quick dinner when we’re too tired to cook” in our house. Eggs=protein! side of veggies and you’re good to go. THANK YOU! After waking in the UK to all the doom and gloom of news from the States I needed something worth getting out of bed for (and yummy as they sound 6 am is a bit early for blood orange margaritas). This looks great and I can’t wait make it. This was hilarious – I laughed (and nodded in agreement) through the whole thing – and boy, don’t I now have to try a chocolate dutch baby for myself! Thanks! I’m reading this at 5:42 in the morning and thinking, “Is it worth it to make this RIGHT NOW when I know it will wake up the kids?” I may wait another 18 minutes just to be on the safe side but it’s definitely in our future. Do you think that this would work with all buckwheat flour vs, the all-purpose? 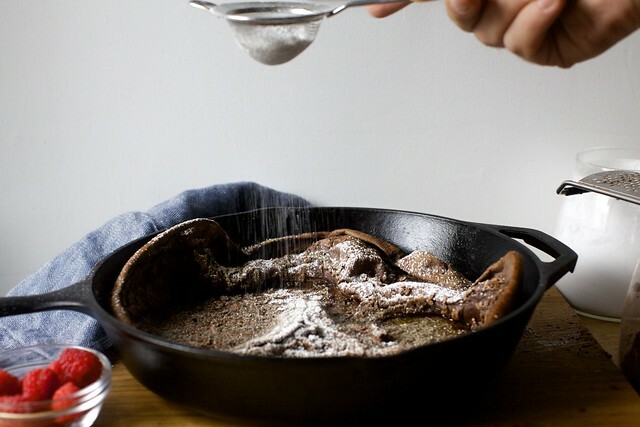 I have done a buckwheat dutch baby before (see here) but with a partial swap. I’d say it gets less billowy but the flavor is nice. This may sound strange, but has anyone had an issue cooking “sweet” stuff in your iron skillets? I have found they sometimes pick up non sweet flavors, from previous items cooked in the same skillet. I always wash my cast iron well when done (and no, it has not stripped the seasoning). I don’t scrub hard, and I don’t soak it, and I dry it promptly, but I sure don’t want garlic & onions from dinner in the next morning’s dutch baby pancake. I think ATK has had a discussion of this as well, perhaps with regard to the notion of not washing salad bowls or coffee pots. I agree with the idea of conditioning a wooden bowl with oil, and understand the concern about detergent ending up in the coffee maker, but oils eventually become rancid, and that seems worse. Yes, I wash mine, and still can sometimes tell what I had for supper, even with the washing. I made curry in one of mine once and could taste it for weeks. Mistake. I can’t offer any solutions. I just wanted to let you know that my taste buds feel your pain. Taste bud empathy! I just made this for breakfast. Had to use unsweetened almond milk instead of milk because that is what I had on hand. I’ve never made/eaten a Dutch baby before, but I think it turned out perfect and tasted fantastic! I’ll be making this again for sure! Thank you. Yesterday was a day that required chocolate pancake for dinner. I made it in my wide, shallow 3 quart le creuset, it worked great. And despite a lack of berries and cream just the idea was enough to get a sullen almost teenager over her sulks and even into the kitchen for the first time in months. So thanks for brightening a difficult day. HOW have I never thought of this before?! Deb, you’re a genius. Chocolate comes from beans, so it’s a vegetable. That’s why it has fiber and minerals. We should all have chocolate as part of our 5-a-day health regimen. Made this for breakfast this morning and loved it. Used a non-stick pan, so I reduced the butter down to 3 T. but could probably get away with even less next time. I didn’t have powdered sugar on hand, so I sprinkled a little raw sugar on top before popping it in the oven. Served with blue berries and just a drizzle of maple syrup, this makes a slightly decadent breakfast that still feels like a real breakfast. I liked that it wasn’t too sweet. This will be a weekend staple in our joint. Updating to add….After making this several more times, I have a couple of tips to add. I’ve had good luck with subbing half the all purpose flour for whole wheat flour (3 T) and found that it still rises well and (thankfully) doesn’t end up tasting too healthy or heavy. We’ve also taken to adding 1/2 T of cinnamon and a pinch of cayenne to make it a Mexican Mocha Dutch Baby. This is delicious. I actually like citrus and dark chocolate/cocoa flavors together, so I macerated about 8 oz frozen raspberries in 2 T sugar and the juice and zest of an orange and a lemon while I prepared it. I also blitzed it all together in my food processor. The depth of the cocoa I used combined with the tartness of the fruit and hint of sugar to sweeten was a real treat! Thanks for the recipe. Just made this for a lazy Saturday morning! So delicious! So gorgeous! So easy! I used my slightly smaller skillet and it just rumpled up the sides more which was lovely! I had also run out of syrup so I made a sauce by cooking some frozen raspberries and it was nice on top. Would the batter keep overnight in the fridge? I really want this for breakfast but will be super-hard pressed for time. I absolutely LOVE puff pancakes (as I grew up calling them), but CHOCOLATE?! Heavens, yes. Here’s the thing though: my face swells up and turns red and gross when I have salt, even part of the 1/4 tsp called for here. Is the salt necessary for the baking science in this recipe, or would it be okay to remove/reduce it? Thank you for all of your fantastic recipes and for sharing them with us! This one will be happening sometime very soon. Love that it’s not sweet. Intensely chocolate flavor! Served ours for dessert with chopped strawberries that we froze last summer within hours of picking mixed with homemade strawberry syrup that we canned the same day and whipped cream. Wonderful! I too felt like there was too much butter. Will cut it back a little next time. This was the perfect start to my Sunday. I love that it’s not really sweet. It was lovely with pb. Thank you for sharing! This morning I made this for my boyfriend, who is actually Dutch :D He said he has never seen any such thing in the Netherlands, but that did not prevent him from gobbing it all up :) Ours didn’t come out billowy in the middle, but puffed up on the outer edges (sort of like a souffle with a hole in the middle) – at one point it was getting so high in the oven that I thought it was going to spill over. Lots of fun and delicious! Hello, we had this for breakfast this morning, and it was amazing!! Thank you – as always. Your Rich Buttermilk Waffles are a favourite already! 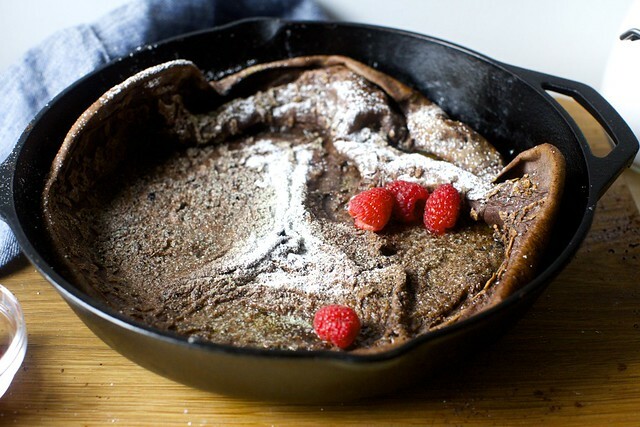 I do have a question about a regular Dutch Baby – if I were to replace the chocolate powder in this recipe with flour, would that work? Much as we love chocolate, there are sometimes I’d like to make regular ones and use lemon juice as a topping. Thanks for the advice! Love your recipes, by the way – the Double Coconut Muffins are my favourite muffins ever!!!! Ealj, check out “German Pancakes” in the archives under the “Pancakes” heading. For a non-chocolate version of this one — I made one on Saturday! — use 1/2 cup flour total, not 9 tablespoons. I just finished eating this and it was a decadent treat! I had tried a Dutch baby before to share with my egg hating boyfriend and he was not impressed with that one. However, this was a game changer. Mine didn’t turn out quite as fluffy as your pictures, but as a previous commenter suggested, I suppose it was more crepe like this time. I did have to make a substitution as I didn’t have milk. Necessity is the mother of invention, so I subbed some hazelnut coffee creamer that I watered down a little since I didn’t want to overpower it all. Thanks for the recipe! Can I melt the butter in the preheated oven before pouring in the batter? I have an old Betty Crocker cookbook that uses that method. Thanks! Sure, why not. But be sure to get the pan very, very hot too. Think of popovers and how the pan needs to be very hot first; the stovetop step isn’t only to melt butter. I just made the Chocolate Dutch Baby this morning for breakfast. As I usually do for the regular Dutch Baby, I used a blender to mix the ingredients and threw it in my 12″ Circulon Paella Pan. I served it with blackberries on the side, along with some vegetarian “soysage”. The consensus was that it was quite tasty and that we would have it again, but it did not puff up like it did for you (in your photo). In reading the comments I discovered why. I should have used a 10″ pan vs the 12″. I like using this pan, so next time I’ll probably do a 1 1/2 recipe and see if that works better. More of anything chocolate is always better, right? 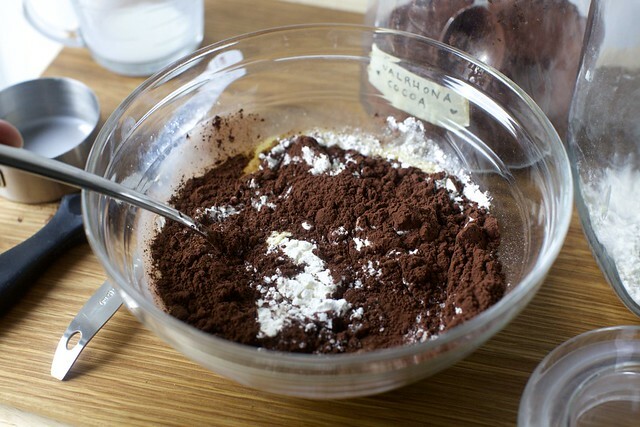 It’s not like the results of this experimentation will be bad… Thanks for posting the recipe! This is perfect and delicious!! So quick, easy, and impressive looking. I topped it with bananas, whipped cream (oops), and shaved chocolate! Tell me more — what kind of pan, what size, did you skimp on butter, etc. Not to blame! I’ve just had a lot of flat ones over the years and have theories about each. Hopefully can help. Made three today for brunch along with baked eggs in greens and mushrooms. * subbed soy milk for lack of cow’s milk. * 20 g black cocoa + 10 g regular unsweetened cocoa powder. * fresh raspberries on top were essential. I made this, and it was delicious! I didn’t use any toppings, and ate it plain. It was delicious as is. Also, since I do have an oven-safe nonstick pan, I only used 3 Tablespoons of butter. This looks awesome. Your childhood German Pancake has become a staple in our household and this will too I am sure. In the German Pancake version we use two cake pans and I just butter the pans. For this, should I also just butter the pan and use less butter in the recipe? I tried it again with good success, left out the chocolate, but didn’t add any more flour in to replace it. It worked well, so I think I’ll try it with almond flour to see if I can make it lower carb. This is marvelous!! I made the gingerbread dutch baby from your cookbook most weekends during the holiday season, and this is a wondrous replacement. The fudginess of the center coming from the same batter as the crisp, fluffy edges seems practically miraculous. Incidentally, it was one of the first breakfasts in my new, high-altitude home, so should you ever wonder: it works beautifully as is up to 5,000 feet! I can’t believe I’m going to write this but this was just blah for us. I usually use the Cooks Country /ATK recipe that calls for 1 less egg some cornstarch and the butter is incorporated into the batter. It’s really good and it poufs. This one was flat and not all that tasty. We served it with berries and some cherry fruit spread from World Market (great fruit spreads at reasonable prices better than more$$$). I followed the recipe exactly – it was way to much butter in my cast iron pan but I went with it. I think a higher temp would have helped Cooks calls for 450. I’m going to play with that recipe & replace some of the flour with chocolate. This is just an FYI – love you Deb & your blog it’s the best. Certainly could be operator error. Or……… its an amazing weeknight dessert with ice cream on top. :o These look very important to try. We call chocolate, “vitamin J” at our house. J for joy! Do you think I could make this in a rice cooker? I’m not sure; I’m sure it would cook, am doubtful it will billow. So my problem earlier was clearly that I was using too big of a pan. Once I went down in size, the batter puffed right up. I tried another time with Truvia 1tbsp, 6tbsp almond flour, a large spoon of arrowroot powder, 5 extra large eggs (to finish up the carton, vanilla extract, and just a dab more milk. And I forgot the salt and cocoa powder again. It came out very puffy and slightly breadier than before, but quite edible. Maybe next time I’ll make this version savory and add spinach on top plus hollandaise (sp?) sauce like a giant eggs florentine. Deb, this recipe looks wonderful and I intend to make it in the morning for my daughter’s 8th birthday–if I manage to drag myself out of bed in time. Because (to alter your kids’ photo caption) for my husband and me, our problems can often be summed up as: Kids. In our bed. Sprawled out and asleep. Instead of us. Our family loves your gingerbread dutch baby recipe (from the cookbook), and this looks amazing too! As a family of six, we would definitely need to double the recipe. I am wondering if you think it would work to cook a double recipe in a 16″ cast iron skillet…or should I just play it safe and make it in two separate pans? I can’t believe I’ve never thought of making these chocolate before — it’s probably because we usually have these for a quick brunch/lunch/dinner instead of actual breakfast or dessert, which would seem more fitting to chocolate. We’ll definitely try the cocoa powder swap [and soon, since I’m recovering from oral surgery and still needing to eat softer foods]. More success! For a doughier (custardy), less dry bread like version stick to 425 not 450. Make sure to use a very fine grind of almond flour. I’m going to run out of arrowroot powder soon. I whisked in about 1/4 cup of herbed Boursin cheese which was getting a little old. It rose to the top and formed a lumpy but delightful crust. I also browned the butter a little more than planned by heating it in the pan in the oven before adding the batter. No harm done. I love to make chocolate recipes. The above choco recipe is very attractive and looks like the soft desert. But, the making is somewhat hard I thing. Anyway, I’m going to try this. This was delicious! I made the batter with skim milk in a mini food-processor and baked it in two non-stick 9-inch cake pans. I used about 1 T butter in each (so half the amount called for), and it was plenty; the rise and rumples were all there. I’ll try using even less butter next time. I’m so excited to make this pancake, but I realized my oven proof skillet is good at 350 but not up to 425. Could I bake it longer, or should I use a 9X13 baking dish instead? I accidentally made this with double the amount of milk, but it’s still good! Maybe tomorrow I’ll get it right. I made this this morning with a 10.5 inch cast skillet. It inflated and billowed and came out just as the one in your pictures and tasted delicious. Total success. Wouldn´t change a thing. Really good with frozen raspberries (which I quick thawed in the oven in what I’m sure is a sacrilege but we had to have berries). I made this twice last weekend, because I forgot to add milk on Saturday. Although there were no leftovers either day I would not recommend leaving the milk out. We loved it on Sunday and will definitely make it again next weekend. and the weekend after. Your recipes are greatly appreciated here. We talk about them like they are a family friend’s. (“Let’s make Deb’s cauliflower tonight!”). Thank you from Vienna, Austria! You are so convincing! By the picture alone, I would place this in the “fancy Saturday” breakfast category. But, you make it sound simple enough to make, and not just for a special occasion. Looks absolutely delicious! I really really didn’t think this was going to work (after making the much hyped but totally flat David Eyre version) but it did!! I think technically there was a bit too much butter (since there was a pool of it which I had to try to pour off the top when it came out of the oven) but it sort of ended up forming a nice salty sauce, and didn’t stick to the pan at all, halleluja! I ended up cooking it for 13 minutes since my oven runs a little hot and I was really glad to have checked and not overdone it, it was perfectly soft. We tried this today, halved because we have an 8″ All Clad fry pan we do our regular dutch babies in that works perfectly (the butter often browns and that makes things so much tastier!). Our basic dutch baby pancake has way more milk than this, which I found interesting. This was a bit flat, though that could have been the 19mth old helper’s mixing skills! Things are often a bit more…dense, shall we say, when she helps out. I’ll try again, and maybe full size on the weekend when dad’s around to help eat it as well. I made this with a 24 cm pan. Just whisking the cocoa powder wasn’t enough for me, so I grabbed my handy – hand food processor and after two minutes all the lumps were gone. It was delicious, but the texture isn’t the texture of a regular dutch baby. Personally, I like this version better. I added a few chunks of dark and white chocolate just a minute before I turned off the oven, and then some strawberry slices on top. “Chocolate is basically a vitamin.” I love how you think! I love Dutch Babies… they taste amazing and the name makes me laugh every time. I can’t wait to test out your recipe! Holy cow, these are so good! I *just* finished making them and had to stop eating just to tell you that I love them! And I’m definitely going to be making them again. I think my grandkids might riot if I don’t! I was convinced when I melted the butter in the skillet and it pooled in the bottom that there was too much, so in an effort to up the – already sky high – virtuousness of this recipe, I poured some of it off. Of course, my otherwise perfect pancake stuck to the bottom of the pan – listen to the master, folks! Another great recipe from Deb! I tried adapting this for a one-person breakfast by making a half-recipe in a pre-heated 9″ pyrex pie plate, something I’d done successfully before with the German Pancake recipe. When I pulled it out of the oven, I had to laugh, as it so perfectly illustrated the saying “flat as a pancake.” Nevertheless, it was a tasty slab, half of which remains to have later on in the day as dessert with some sweetened whipped cream. Chocolate’s made from beans, beans are vegetables, vegetables make up salads, so CHOCOLATE IS A SALAD. What did I do wrong? I followed the recipe exactly and I got a brown rubber mat floating in a pool of butter. I just made this in a 9 inch glass pie pan and it puffed nicely around the sides, but I didn’t love it. It was too dense in the middle and could have used a little more sugar or maybe some vanilla; I can’t stand overly sweet anything so it’s saying something for me to feel this was missing a bit of sugar. I think I may tweak this and try one less egg–Fwiw, I made sure the eggs were at room temperature and blended everything in the blender. Don’t know if this helped re: puffing. This is most definitely good, but there are so many other things that are better! Including lots from Deb. I’d say don’t bother unless you really want to impress someone with all the poufiness (which it definitely did). I agree that, with a nonstick at least, you can probably use 2-3 Tbs butter only. I was too lazy to do the grated choc. on top, and maybe that’s why I thought it was less than stellar. I might make it again . . . but I personally would rather have scones, or regular pancakes, or cardamom french toast, or even just a yummy egg/cheese omelet. Just one girl’s opinion. I made this this weekend. Subbed coconut oil for the butter and soy milk for the milk, because of a dairy allergy. Turned out beautifully. The pancake itself was a little bland, but when topped with maple syrup and frozen berries it was delicious, and was the perfect chocolately vehicle for the deliciousness of the toppings. Will definitely be making this again for breakfast! Thank you so much! I halved this recipe and made it in a 9″ pan this past weekend, and it was OUTSTANDING. I kept the sugar the same, because I like a sweeter pancake, and just topped it with just a touch of blueberry jam and maple syrup. I’m making this again next weekend. This is delish! I’ve made this as is and also gluten-free, using 4 TBS buckwheat flour and 2 TBS sweet rice flour. It doesn’t rise quite as much when it’s gf, but still yummy. I served it with strawberry compote. This recipe turns into a beautiful dutch baby! Perfect curves. And – it wasn’t too sweet – so we still get to pile it with fruit and syrup. I made this for the first time today. I poured the batter directly over the melted butter but did not stir them together. When I brought it out of the oven the butter was bubbling all over the top of the pancake. Is this supposed to happen? It tasted good but was just a little greasy. I used a 12″ cast iion skillet. Yes, that’s common. You could blot it with a paper towel if you’d like less butter when you eat it, but you don’t want to use less when actually making it because it could stick to the pan [I’ve experimented with varying amounts of butter, and less = sticking, every time]. Made this the other day and it was a very quick, tasty little breakfast. I topped it with the recommended powdered sugar, berries, and maple syrup. I’m wondering if the problem people are having with the pooling of the butter is that they aren’t swirling the butter to coat the sides of the dish too? I had zero pooling and used just about the full 4 Tbsp. Also, I gotta say, I know Deb’s tongue-in-cheek description of it being healthy, but really, there are many worse things. It’s got an impressive amount of protein and a limited amount of flour, and yes there is butter but depending on how many people you feed with this (anywhere from 2 to 4, I’d imagine) it is pretty darned respectable. Anyways, I’ve already had requests for a repeat, so I would said it is an impressive thing that you can throw together with such little effort, so really, what’s not to love. A crowd pleaser for sure. Deb, I tried to make this today. Never eaten a Dutch pancake before so had no idea when to know if was ready. I don’t think I got it quite right… Can I ask for your advice for next time? Halved the recipe and cooked in an 8 1/4″ pan (didn’t have a 9″). Used GF flour and a bit less butter (being lactose intolerant!) but otherwise the same. 1. 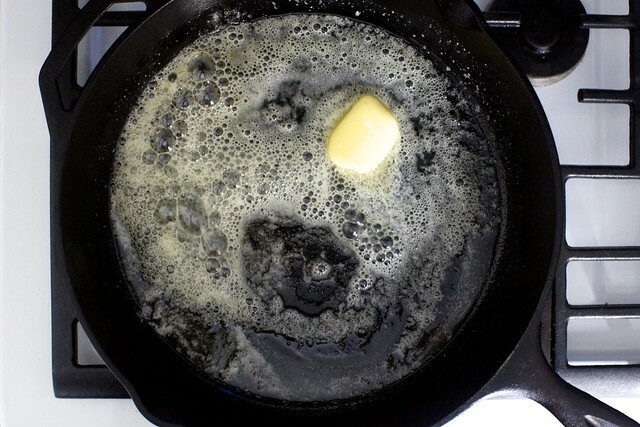 When adding the batter to the melted butter in the pan should you mix it in or just leave it to randomly mix? 2. How do you know when done? Our oven runs hot – checked at 11 min (wasn’t sure if the cooking time was less with half mix) and was cooked through, but not billowy – puffed up the sides massively but flat in the middle. At 15min was cracked on top and still not billowy so I took it out. It slipped out the pan no problem so wasn’t sticking. It’s got a dense chewy texture – is that over or under cooked? Wish I could show you the photo I took! Can’t add it here. Thanks so much! 1. Don’t mix, just pour it over. 2. It’s done when there’s no raw batter in the center; it’s okay if the edges are a little cracked but there should be no whiff of burnt pancake. Sometimes they rumple in the center, sometimes they do not, but with these proportions, I find I have the best luck/odds of getting it to happen. Thank you! Shall def try again. Perhaps 11 min was enough then for next time. i have only made a dutch baby once before, and while it was delicious, it didn’t billow or really do anything at all. it was more like a thick pancake. so i was prepared for the same to happen with this one. instead, when i opened the oven this thing was up so high i had nearly singed the edges! pretty flippin’ cool. the only ‘changes’ i made were that i used regular salted butter (i don’t ever use unsalted) and i used half & half instead of whole milk because we were out of milk. we had it with raspberries, powdered sugar, a tiny drizzle of syrup and…a little scoop of häagen-dazs coffee ice cream on the side. HEY! DON’T JUDGE ME! coffee goes with breakfast! and it’s 95 degrees out in boston in may! dang, it was good. and pretty. if i had one “complaint” which is really more like a caution, it’s that it didn’t really taste like chocolate to me. i kind of was expecting a brownie flavor, but perhaps that was unrealistic. 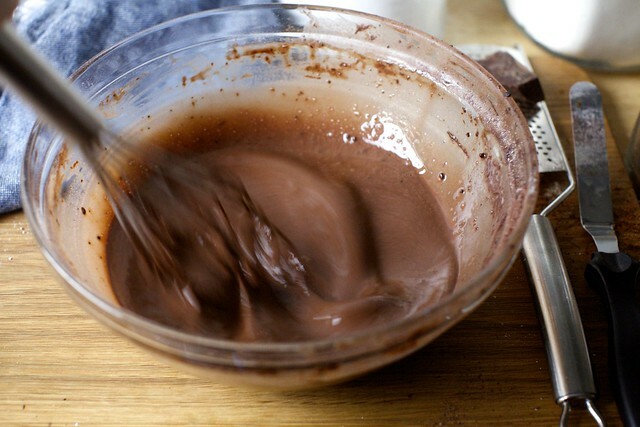 i also was using regular ol’ hershey’s cocoa, so maybe a fancier one would be more chocolate-y, as of course would adding chocolate chips to the batter or chocolate shavings afterwards. just a little disconnect between expectation and reality, but again, it was so good i really didn’t care. I’m so glad it was a hit. I’m always fiddling with proportions and I find that too few eggs for the pan size leave you flat, too many, it crawls up the side like a giant bowl — definitely cool but not so ruffly. Re, brownie flavor: More sugar, actually. The chocolate is there, even with unfancy cocoa. But the sweetness isn’t there to back it up so the chocolate intensity is brownie-like (or seemed to me that it was) but it doesn’t taste like a brownie because a brownie would have much more sugar. Feel free to use more next time. First smitten kitchen recipe that failed on me. Followed all the directions and it came out HUGE but undercooked and not at all soft and pillowy. The butter also pooled on the top, so I can’t imagine that helped. But we liked the flavor so I’ll give it another try some time. I just made this for my husband for Father’s Day! It had spectacular puffiness right out of the oven! Thanks for another stellar recipe!! We’ve been trying a few dutch baby recipes recently (we started with your delicious cherries and almonds one!) and this was definitely not as enjoyable as the others. We’re no strangers to the amount of butter a dutch baby requires, but for some reason it really pools on top of the cooked pancake in this version in an unenjoyable way. And the chocolate flavour was just ehhh – I think I’d prefer my chocolate “straight” on top of a regular dutch baby instead of trying to make the batter itself chocolatey. Fun to try though! I made this for breakfast and it turned out beautifully! I used an extra T of cocoa powder and one less of flour, cooked it in a 10″ cast iron skillet. Topped with strawberries and mini chocolate chips. Next time I’ll have some whipped cream too. Hi Deb, I noticed a lot of questions about pan sizes. My non-chocolate Dutch Baby recipe comes from ‘Sunset Ideas & Recipes for Breakfast and Brunch’, 1980. Sunset offers a recipe chart based on pan size. I don’t know how this fits into your recipe, but over the years it has helped me prepare Dutch babies for all sorts of occasions. Before cooking, I measure the pan with water to know what size pancake to make. I can’t wait to make your chocolate one–I may need to add some vanilla pears on the side….. This just popped up in my FB Feed. 25 minutes later we are cheering it to the table. Perfect for a chilly Fall morning. Delicious. Used a bit less sugar in the batter and chocolate chips instead of shaved (‘cause that’s all I had). We sang all through our bemreakfast!! I replaced the sugar with a banana, added a cup of kale, and used almond flour. The pancake doesn’t billow, but my kids still scarfed it down. We had this for brunch today, and loved it! I love chocolate, my husband less so, but we were worried this would be too sweet and decadent for breakfast. But it was perfect, filling but not rich. The extra eggs gave it some heft, more than the other Dutch baby’s that I’ve tried. We were out of fruit, but used maple syrup, ricotta, and jam on top. My husband said it is definitely a do again. Deb, have you ever tried/compared the america’s test kitchen version? they start in a cold oven (!!!) it was a tasty one! i’ll be working my way through all of your variations soon; my husband declared it tastier than regular pancakes with the added bonus of being easier! I had no idea anyone else anywhere knew what a Dutch baby is, much less made one. I got my recipe from my sister-in-law many years ago – she did not explain the name, and as a new bride I decided I’d rather not learn any family secrets involving baby pancakes. It is my go-to “company” breakfast item – maybe dessert now, too. Much as I love to use my cast iron pan, I’ve found that these spectacular pancakes rarely stick when I make them in a handmade pottery baking dish (like a baking pan for cakes, but pretty with a fluted edge). Maybe my cast iron skillet just needs more seasoning. Anyhow, the pretty Dutch Baby looks very pretty in my pretty blue dish. This was great! It rose like crazy around the edges and less in the middle, but I used a nonstick skillet. It turned out thinner and more crepe-like than I had expected after it fell, but we enjoyed it. I agree it’s a much healthier option! Surely this could be cooked more quickly in a microwave, using a silicon cake ‘tin’. If so, can you suggest how long a baking time that should take? This would definitely *not* work in a silicone pan. The heat of the pan is what causes the batter to climb up on the sides, and that’s just not possible with a silicone pan because silicone is an insulator and it wouldn’t get hot enough.